In my constant exploration for virtual reality resources and tools, I think I've found the holy grail for VR creation! The Thinglink 360° & VR Tool is one of the easiest and most classroom friendly. I've put together a four part blog series. 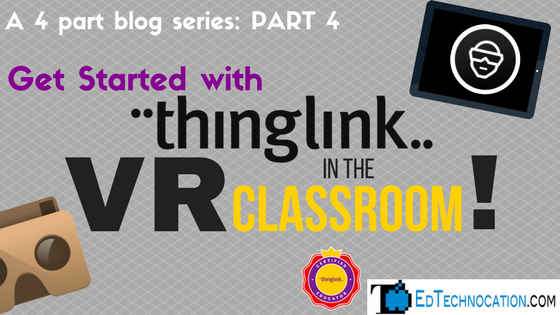 In part 4 I explain how you can easily get started with Thinglink VR in your classroom. Part 1: Thinglink is Bringing VR to Every Classroom! Part 2: Creating Thinglink VR is a breeze! In Part 1 I explained the cost associated with accessing the Thinglink VR Editor. You can get a Teacher Premium subscription for $120 per year and that allows you to give up to 350 students access to the VR Editor as well. That's more than enough for an entire school! I manage the Teacher Premium account at my school and simply add other teachers and students as "members" in my account to give them access to the editor as well. Use the Thinglink Remix option to borrow 360° images from other Thinglink users like mine! 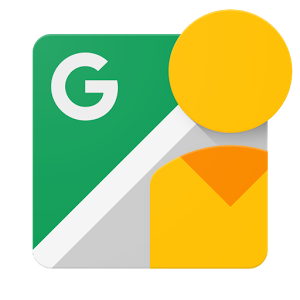 Use the free Google Street View app and it's 360 image capture tool that uses the built in on your mobile device. Students get really good at this process really fast! Use the Pano Fetch Chrome Extension to extract 360° Google Street View images on Google Maps. Google Street View is the easiest way to create 360° images. The greatest thing about these types of projects and the tool is that you don't really need specialized or expensive equipment. The rest of the content (images, videos, audio recordings, text) can all be collected by searching the web or creating original content with mobile devices and laptops. In the example student projects I shared in Part 3, students used iPads to gather original content, create the 360° images, and develop the Thinglink VR project. If you need more inspiration check out my Thinglink Collections! 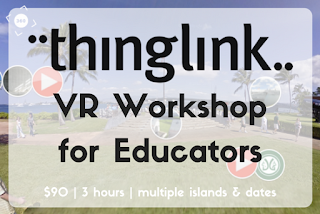 Get Quality Professional Development for Virtual Reality & Thinglink VR in the Classroom! I've been exploring the use of virtual reality in the classroom for the past two years and have been sharing, presenting, and training on the topic for about a year. 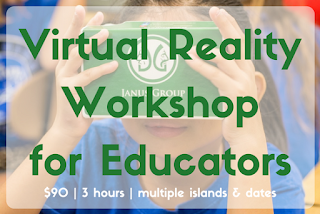 Starting in April (and through July) I'll be helping to roll out a series of workshops on VR and Thinglink VR in Hawaii on multiple islands. Join me! There is so much amazing VR content out there! But I found, in talking with other educators, that it was really difficult and time consuming for them to sort through it all and figure out what's worth keeping and using. So I've developed a #VRinEDU resource website designed specifically for educators! 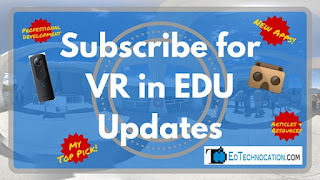 Check it out and click on the image to the right to subscribe to my free VR in EDU Updates Newsletter!